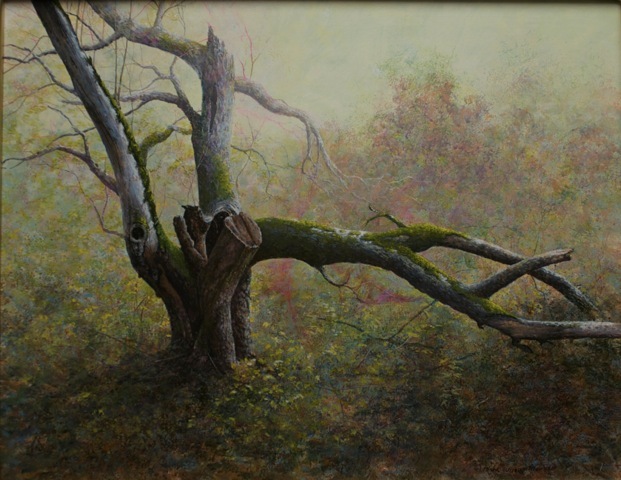 Most egg tempera work is done in a cross hatching style, as the paint dries so quickly. The paint lends itself to drawing lines, rather than the soft buttery laying down that oil allows. 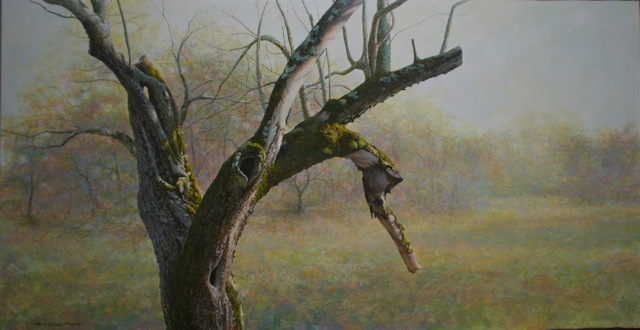 But, Mark Meunier works his technique almost like oils, choosing a primary palette, glazing with the medium and working realistically. 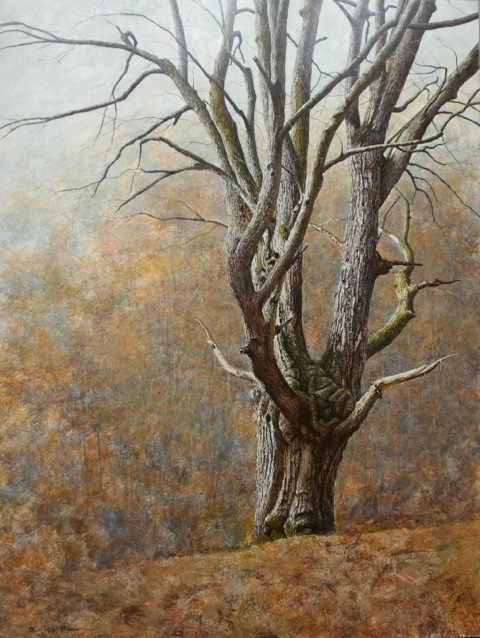 Mark has taken the difficulty and tension out of egg tempera and created a technique that anyone can use. Choosing a primary palette of eight colors, white, yellow ochre, yellow, orange, red, prussian blue, burnt sienna, and ultramarine blue, Mark created a simple palette with small cups of pigment laying around the borders. On the corner, a cup of egg yolk and a bit of water mixed waits for dipping. He doesn’t grind down each color first as is the tradition of egg tempera, but instead, mixes his colors on the palette. There isn’t a formula, he says, for the exact amount of egg and water to mix, but getting all of the egg white off the yolk is vital. Roll the yolk around on a paper towel before using and add water, no need to worry about distilled water or organic fresh farm eggs, either. Just use what you have, and create an emulsion that works. Working on an absorbent surface, like Claybord™ is best, as the egg needs something to soak into to adhere correctly. Traditional gesso was the original substrate that Mark used, but he found that Claybord works very well and he doesn’t have the laborious process of making his own gesso. Lastly, varnishing isn’t necessary, but egg tempera is soft and sensitive, so it is up to the artist. Do note, however, that varnishing will change the piece as it will pop the colors. Egg tempera has soft darks, more muted hues, and varnishing will alter the piece.